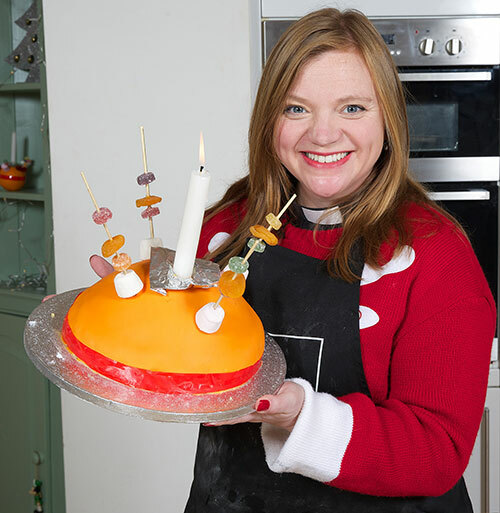 Songs of Praise and Gogglebox star Kate is hoping to inspire some festive fundraising with her ‘Christingle’ Cake, made from orange vanilla sponge, marmalade and fondant icing. It’s the perfect cake to enjoy throughout the festive season – whether at a Christingle service, a family party, or even as a fresh alternative to a traditional cake on Christmas Day. Kate’s recipe is available for free on The Children’s Society’s website, but she is asking anyone baking her ‘Christingle’ Cake to make a Christmas donation to the charity’s work to support vulnerable children and young people. Christingle is a festive celebration often popular with children and revolves around the lighting of Christingles – oranges decorated with a candle, red ribbon, dried fruits and sweets on cocktail sticks. These items highlight different parts of the Christian story and signify light and hope. The Children’s Society brought the Christingle tradition to the UK nearly half a century ago and since then their events have been raising millions of pounds for the charity’s work with vulnerable children and young people each year. Kate said: “Christingle is one of my all-time favourite services in church as it’s so magical and exciting and also extremely inclusive. The whole community comes together to enjoy the event and it’s wonderful that so many people give generously to help give vulnerable young people the promise of a brighter future at Christmas time”. For more information or to support The Children’s Society’s Christmas campaign please donate here. Kate’s Christingle Cake recipe: watch the video here or download a pdf.